Afghanistan National Anthem was different in every government of Afghanistan. First what is national anthem? A national anthem is a generally patriotic musical composition that evokes and eulogizes the history, traditions and struggles of its people, recognized either by a nation's government as the official national song, or by convention through use by the people. An anthem can become a country's national anthem by a provision in the country's constitution, by a law enacted by its legislature or simply by tradition. The majority of national anthems are either marches or hymns in style and can be played in holidays such as independence day or national day, and other historic days depending on the countries. The Afghanistan national anthem or "Surodi Milli" was adopted in 2004 and formally recocnized in 2006 by Hamid Karzai as the president of Afghanistan. The lyrics of the current national anthem of Afghanistan were written by ‘Abdul Bari Jahani’ an Afghan poet in Washington DC USA, the music was composed by Babrak Wasa in Germany. 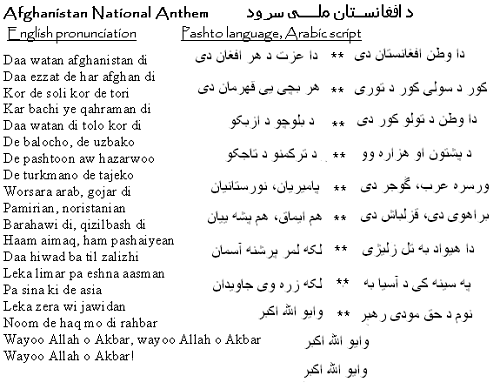 In the new 2004 constitution of Afghanistan which was adopted during the early stage of Karzai government emphasizes, that the lyrics of Afghan national anthem should be in Pashto language, although it is the second spoken language in Afghanistan as well as God (Allah) and the name of all ethnic groups should mentioned in the national anthem. The lyrics of previous Afghan anthem which was used since the early 1990s more expressed the deaths and sacrifices of people during the war and occupation of the Soviets from 1997 to 1992. This lyrics of the new Afghanistan national anthem more expresses the unity of all nationalities if Afghanistan. The English Translation of Afghanistan anthem.